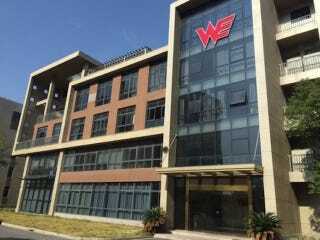 Team We, which stands for Team World Elite, one of China's earliest and largest professional e-sports groups, is now expanding its base, this time by directly nurturing new up and coming players in its own e-sports training camp in Shanghai. In a release sent out by Team We and published on various Chinese news sites, the team confirms that their new Shanghai-based e-sports campus is now open for sign ups. Previously, Kotaku reported that a Chinese e-sports outfit was working on a boot camp—now, it turns out, Team We is also in the mix. In the same location no less! The boot camp, located near the college town portion of Shanghai, has everything from classrooms to dorms. Judging from the photos, the conditions at Team We's bootcamp look much better than those found at the average Chinese university campus. The five story standalone building's dorm rooms alone put top tier Chinese universities to shame. Kotaku has reached out to Team We on whether the boot camp will admit foreign applicants. We will update you as soon as we hear back!